The Memory of Us by Camille Di Maio - This book is not only a romance, but it is about a forbidden love. I have already dived in, and the plot has grabbed my attention from the first couple chapters! The Vacationers by Emma Straub - What better book to read at this time than one about a family going on a vacation together during the summer! This is not a book I would normally read since I have always read really dramatic historical fiction novels. My mom did not want me reading anything sad anymore, so she went to the book store and asked for a novel that was a lighter, more enjoyable read. This book was highly recommended, and I can't wait to sit back and start reading it. 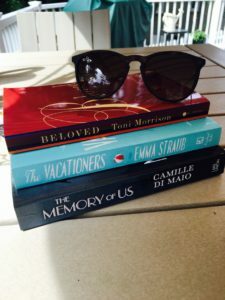 Beloved by Toni Morison - This is one of my assigned summer reading books. Usually students dread what is assigned by teachers, but I actually am enjoying this read. It is a classic, so if you are required to read it too, go into it with an open mind. I have started reading it, and it has not disappointment me yet! When reading by the pool, on the beach, or anywhere in the sun, it is important to have the right sunscreens! Books can pull you away from the real world and next thing you know, you are burned from head to toe. Make sure to check out my Summer Essentials post to learn about what I keep in my bag for the summer and my reading adventures!